A ring, is by far, the most popular piece of jewellery. The tradition of exchanging finger rings roughly dates back to over 6,000 years ago, clearly indicating that the tradition withstands the test of time. Turning ashes into cremation rings rests on this tradition of using rings as a way to remember someone. Today, a ring might also be one of the biggest and most cherished jewellery investments you’re likely to make in your life. We’ve taken painstaking care to educate you on your quest to discovering the perfect memorial ring. We’ve gathered information to help you find the keepsake ring which helps you preserve the cherished memory of your loved one. A brief peek into world history will tell you that rings -made from shells, stones, and even bones- survives and predates prehistoric times. To the Ancients, a ring was a symbol of love and power. It was rare, spiritual and magical.The knowledge of metals and gemstones (gold and diamond in particular) were an integral part of spiritual and social ascension to our ancestors. 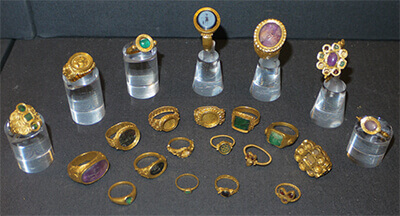 Rings were extremely popular and specific rules were strictly observed in the fashion of rings. While plain signets and bronze rings could be worn on either hand, stone-studded rings were firmly reserved for the left hand. These ornaments were, and still are a universal form of adornment - a symbol of love, health, power, protection, and status. People exercised a great deal of effort in mastering the art of working with these treasures. In time, they networked sophisticated techniques to make some of the most elaborate and intricate ornaments. Although the diamond was first discovered in India, it soon found its way into the caravans that travelled to Western Europe. 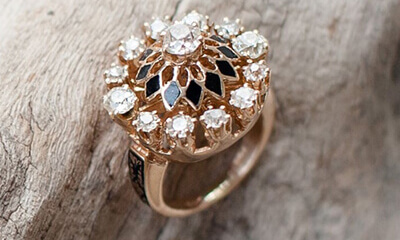 In fact, many believe that it was the Victorians who popularized ornate diamond ring designs. The start of the 18th century saw the exchange of diamonds like never before. Brilliantly-cut diamonds sparkled and dominated jewellery design. Jewellers incorporated antique and traditional designs with diamonds and gemstones so as to craft out some of the most beautiful and fashionable motifs. Over the years, the frontiers of ring designs have been continually redefined. Avant-garde jewellers continue to break conventions by exploring designs that embrace both beauty as well as ease of wear. Today, the popular round cut – which consists of 58 facets that categorize the stone into a top and bottom half joins the likes of the princess cut, the emerald cut, and the oval cut to give the consumer a wide range of options. All of these are available when designing a cremation jewel or ring grown from the ashes of a loved one. Rings made from cremation ashes are referred to as cremation rings or cremation jewellery rings. Memorial diamonds have been in vogue only since the early 2000’s. Just as a real diamond symbolizes eternity, a memorial diamond allows a relative to treasure the cremation remains of a loved one forever. Given the contrast between a pure, precious, and treasured diamond to that of a neglected, ignored and overgrown grave, it is no wonder people with a close relationship to a deceased loved one use memorial diamonds as a way of keeping the deceased close to them. While engagement and wedding rings continue to dominate the world of rings, memorial rings aren’t far behind. Memorial or cremation jewellery in general or rings in particular are becoming a popular trend. People from all walks of life are beginning to look at turning ashes into rings as a way to seal their love in a special way. In essence, there’s no better way to treasure the memories of a lost one than to capture their essence in a keepsake ring. While most natural diamonds are formed deep within the depths of the earth’s mantle, memorial diamonds are genuine and certified jewellery level diamonds that are grown in laboratories. Memorial diamonds can resemble the appearance of a blue diamond but come in other colours, including Purely Colorless™. A diamond is 99.9% carbon and the human body is 18% of carbon. Memorial diamonds are created by isolating the carbon content from crematorium remains. They have the physical and chemical properties of a natural diamond and are created by simulating the environment of a natural diamond in order to use the purified carbon from the ashes and hair of a loved one. However, given the fact that they’re artificial, ashes to diamonds aren’t considered equal and cost relatively lesser than their natural siblings. 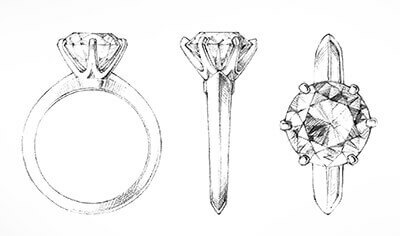 A gemological screening can distinguish the authenticity of natural diamonds from memorial diamonds. Engagement rings accommodate a more elaborate and multifaceted design, including multi-stoned settings. The design of a memorial ring from ashes of a loved one is generally more minimalistic and plain. The design emphasizes the main stone. This is not a surprise, since these rings made from the cremation ashes of a loved one are well used as keepsakes to remember the deceased loved one. How to Choose the Right Setting for Memorial diamonds? Memorial diamond rings reflect the love you have for the deceased, in addition to purity and eternity. This explains why they have become as popular as they are. These rings which are made from cremation ashes are the physical remains of your loved ones, and provide a tangible connection to your loved ones long after they have gone. Your cremation ring reflects the unique spirit of your lost one, and can help you maintain a long-lasting connection with them. Our memorial diamond rings come in a variety of designs. While we recommend simple settings such as the prong, bezel or tension settings for ease of wear, we believe settings such as the pave and halo settings will give your diamonds a more dazzling effect. The fact is that cremation jewellery or rings from ashes can be designed to reflect the life of the deceased and celebrate your relationship. We put this at the very top of our list as it is the most classic and common ring settings of all time. 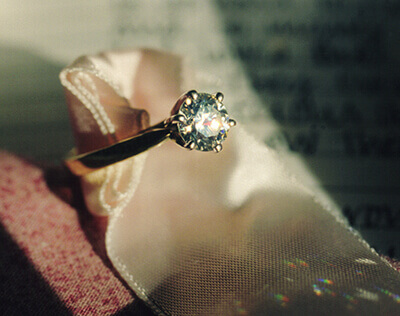 A prong is a small metal claw that is used to firmly grip the memorial diamond. A typical prong setting can feature anywhere between four and six individual prongs. The design minimizes the presence of metals while allowing light to show the brilliance of the memorial diamond. 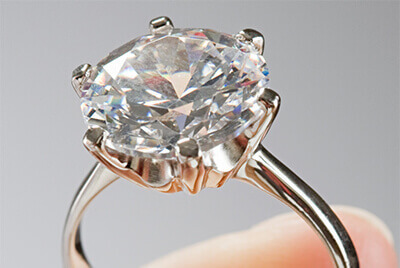 In 1886, Tiffany & Co created what is the most extraordinary prong setting. The Tiffany setting is a six-prong solitaire setting that minimizes the reflection of light on a diamond. This design gained immense popularity and was famously patented. The setting stands apart as a result of the specific prongs and knife-edge shaft used. While there may be many versions now in use, none emulate the perfection and intricate design of the original. 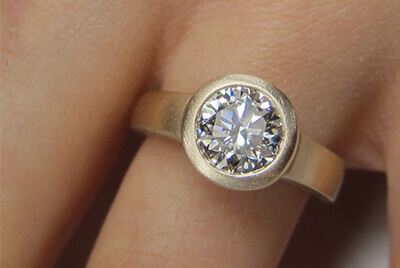 The bezel setting is the second most popular ring setting. 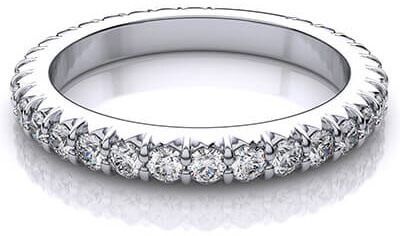 It’s modern and chic design encircles the diamond within a thin metal rim. While a full bezel encircles the diamond completely, a partial bezel exposes the sides. This simple and effective design holds the diamond securely in place while allowing the memorial diamond to shine in all its glory. 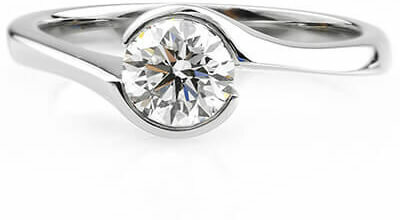 Popularly called a floating or suspended setting, the tension setting uses tension to suspend the memorial diamond, creating the appearance that it is floating in the ring. Known as a radically different and unique design, this setting showcases the color and brilliance of your cremation diamond. Rings made from ashes using a tension setting stand out of the crowd. The pave setting mounts smaller diamonds together with minimal metal exposure between them like bricks paving a street. 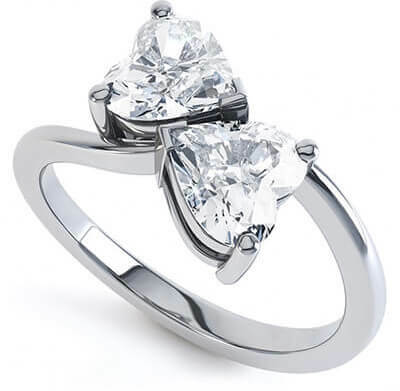 A ring with this setting appears as one large diamond. The setting is an interesting choice for rings from ashes of several family members tightly packed as a single stone. The pave setting is appealing while setting smaller or less brilliant memorial diamonds. Rings with a halo setting arrange a cluster of diamonds in a concentric circle or square, usually surrounding a single center stone. Like the pave setting, the halo setting enhances the overall appeal of a ring by making it appear larger. In addition, the setting can highlight the brilliance of memorial diamonds, making this a popular setting for rings from ashes. How to Personalize Memorial Rings? A memorial diamond is a keepsake that helps you cherish your deceased loved one forever. To enhance this, Lonité offers five other ways in which you can add personal touches to your cremation rings. 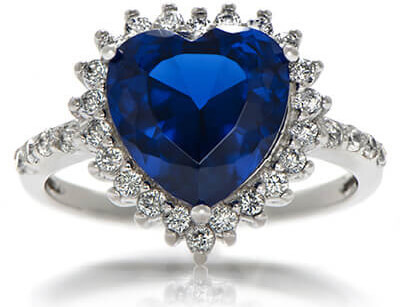 The beautiful heart-shaped ring can be the perfect memorial ring design. A heart-shaped ring captures the memories of your loved one with a symbolic heart shaped diamond. 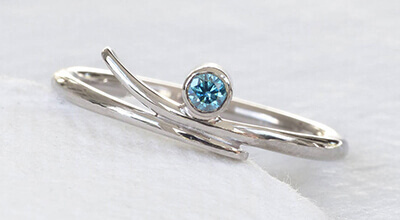 Noted for its simple and symbolic appearance, this design is a beautiful way of remembering your loved one. Lonité can also provide heart shape memorial diamond cuts under your special request. Designed to create a permanent display of a cherished item, the vial design enhances the concept of holding your deceased love one close to you. A vial is a small charm with a tiny opening. 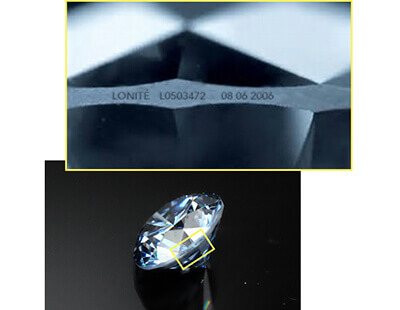 Lonité can create a vial from your memorial diamond before mounting it into your cremation ring. We will create a small sealable opening into which you can insert tiny contents that your loved one used before their death. 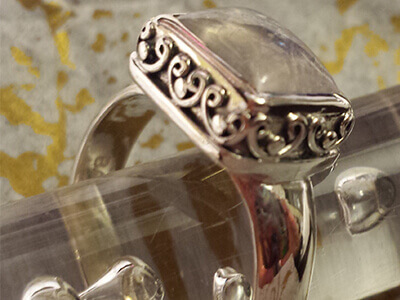 The contents inside the vial, made out of a Purely Colorless™ memorial diamond, can be seen from the outside. This design allows you to preserve precious contents in the sealable vial capsule. 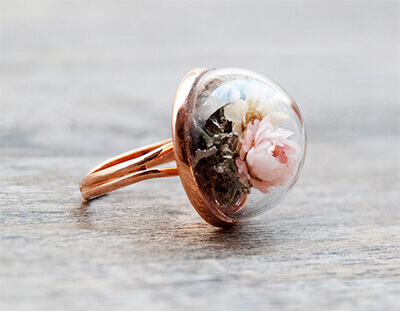 This extremely unique design carefully treasures a physical memory of your loved one in the most secure and tangible way. 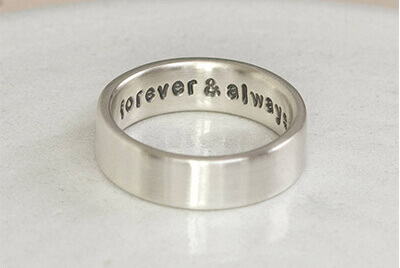 Personalized messages can be hand stamped or engraved into beautifully crafted rings. What’s more, you can also create a personalized message stencil using your loved one’s handwriting. This cremation jewellery ring design is ideal for people who want to remember a special message from the deceased loved one. You can also add the name of your loved one to the memorial ring which contains diamond(s) made from your beloved ashes. Laser inscription makes it possible to engrave your personalized love message on the griddle of the diamond. What better way to remember a loved one than to capture and duplicate their exact fingerprint onto a ring. 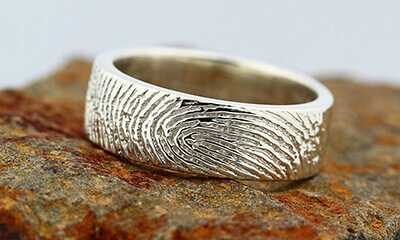 This absolutely unique ring design allows you to feel the fingerprint of your loved one as you touch it all round. An inner message in cremation jewellery makes or rings puts a raised message on it's inside which then transfers to the skin when it is worn. This unique design physically reflects the impression the loved one has made on your life. Inner message rings may be the most profound way to imprint the memory of your loved one forever. How to choose the Right Metal. Only the finest metals can match the enduring quality of a memorial diamond. Each of the options provided to you has its unique properties. Learn more about each choice to decide on the right metal for your cremation ring. Backed with a purity range of 90% to 95%, platinum is by far one of the strongest and most enduring metals used in jewellery. Platinum is resistant to damage and does not wear away with time. Characterized by its white undertones and its rich and exquisite appearance, this metal develops a satin finish when polished. It is one of the most sought metals in the world of jewellery, and one of more expensive metals in the market. Gold is commonly used in jewellery, easily rivaling platinum in popularity. It is also relatively less expensive than it's other counterpart. Available in hues of yellow, white, and rose colours, gold is an extremely versatile and elegant metal. While yellow gold is known for its traditional and timeless beauty, white gold is subtler and mimics the appearance of platinum. 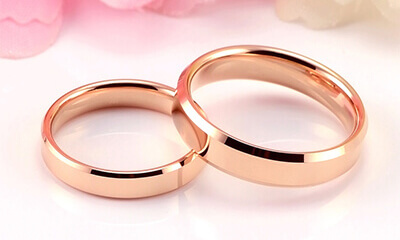 Rose gold is an alloy of gold mixed with copper that impresses with its rosy red tint. Palladium, like white gold, mirrors the radiant and shimmering appearance of platinum. It is far more long-lasting than white gold and hence more popular too. 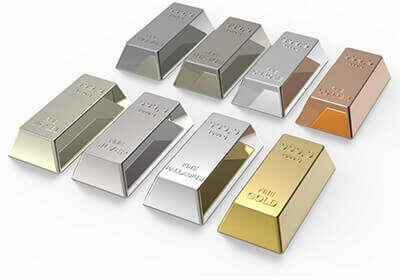 Regarded as one among the most fashionable metals, Palladium is blanketed into the platinum group of metals. Fortunately, despite its similarities with platinum, Palladium is softer than platinum and hence more affordable too. Palladium combines the appearance of platinum with the flexibility of gold, resulting in a metal that is ideal for ornate and contemporary jewellery. Silver is one of the most affordable precious metals used in jewellery making. Like Gold, pure Silver is very soft and is therefore vulnerable to damage easily. Mixing silver with metals such as copper results in a stronger metal, making it more suitable for jewellery making. Like gold, silver is rated based on the percentage of silver in the “mix”. Sterling silver is one of the metal’s purest forms, containing a minimum of 92.5% of pure silver. Platinum Pale Greyish white An enduring, Long-lasting, and strong metal Composed of 95% platinum and 5% other pure alloys Expensive Is resistant to damage. Does not wear away. Palladium Similar to platinum and white gold. However, unlike white gold, it does not require rhodium plating A rare metal with high level of purity. Composed of 95% palladium and 5% other pure alloys Less expensive than platinum Is strong but relatively lighter than platinum. Easy to polish and repair. 18K gold Yellow, white, and rose A traditional metal with a high level of gold purity Composed of 75% gold and 25% pure alloys Less expensive than platinum. Nonetheless, it is highly valued. Is a soft and pliable metal. Apt for ornate and contemporary jewellery. Easy to polish and repair. 14K gold Yellow, white, and rose A strong metal used in all types of jewellery. Composed of 58.3% gold and 41.7% pure alloys Less expensive than 18K gold. Nonetheless this too is highly valued. Is a soft and pliable metal. Apt for ornate and contemporary jewellery. Easy to polish and repair. Silver Metallic grey A metal that is of soft enough to make jewellery of all types. Composition of silver to copper is 92.5% to 7.5% copper. Least expensive in comparison to the above metals Is a soft and pliable metal. Apt for ornate and contemporary jewellery. Easy to polish and repair. 1. 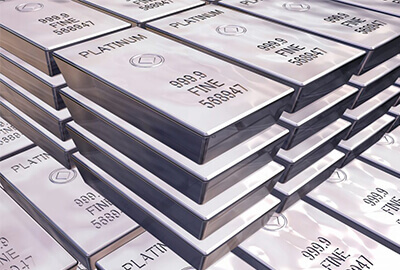 What's the difference between white gold and platinum? 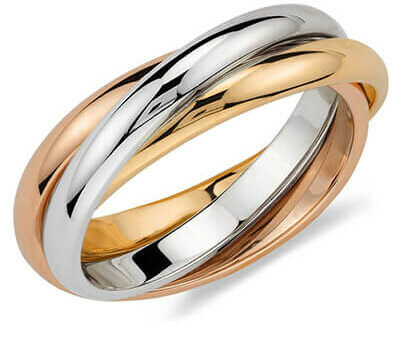 Gold and platinum are the two most popularly used metals for rings. As unique as each may be, they are also similar and are commonly compared. 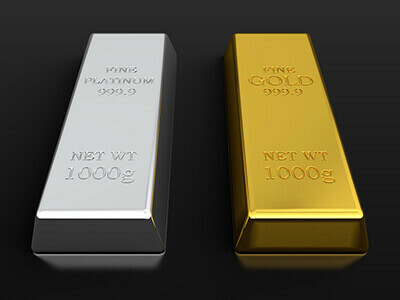 By far the most distinguishing physical trait between gold and platinum is their color. Platinum is a naturally occurring white metal and gold in its natural form is always yellow. 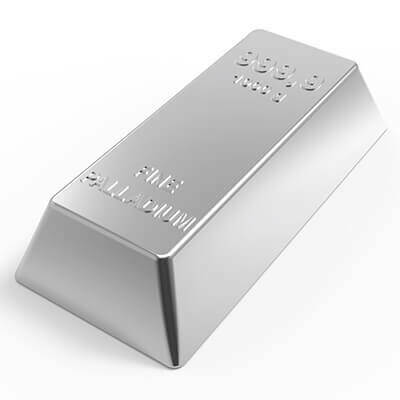 Platinum is also a much stronger metal than gold, which is extremely soft in its pure state. So, to mimic the appearance and strength of platinum, white gold is treated with a thin plating of rhodium. While this approach works temporarily, the rhodium plating tends to wear off over time, revealing the color of the gold alloy underneath. The other differentiating factor is their composition. Although white gold mimics the appearance of platinum, it differs in composition, density, hardness, and other properties. 2. 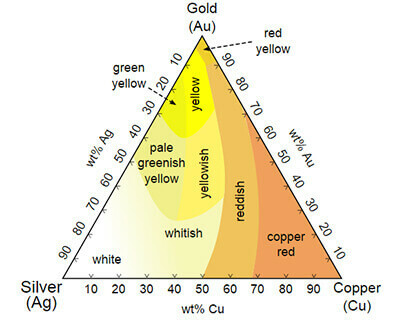 Why gold may have different colors, such as, white, rose, and yellow? In its natural form, gold is distinctively yellow in color. 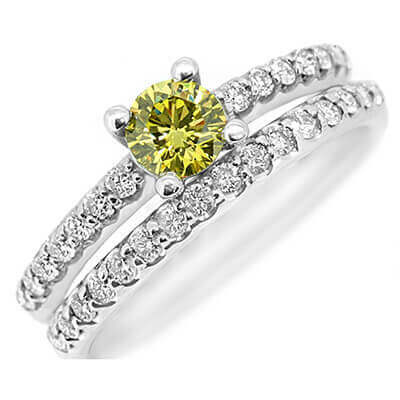 However, some times, a single tone of yellow can be overpowering and creates too strong a contrast for most jewellery. To address these problems and create more variety, gold is mixed with other metals so as to create alloys and different hues. Depending on the metals added, gold can come in a variety of colors including shades of yellow, white, and rose. 3. 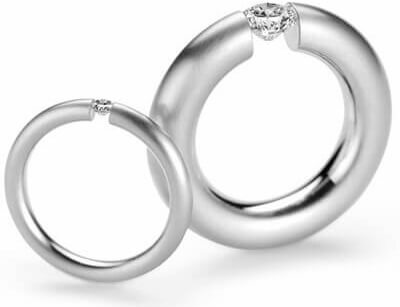 Which is the best metal for memorial diamond rings? Jewellery is very personal, more so is memorial jewellery, and so the “best” metal is the one that is right for you. 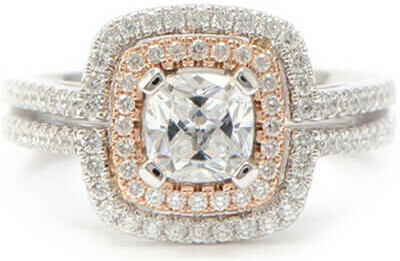 However, platinum, 18K gold and 14K gold are the most commonly used metals for memorial diamond rings. Platinum comes with a soft white hue and a purity backing of 90% to 95%. It’s 40% heavier than 14K gold and doesn’t tarnish or oxidize easily. Clearly as the most refined and expensive of the three choices, platinum has what it takes to bring out the beauty of your ring. Gold is relatively less expensive and so preferred by some people. In addition, its naturally warm and diverse colors make it the standard for jewellery. 24K (karat) gold is the purest form of gold, but is so soft it is vulnerable to damage when used in jewellery. Instead, both 14K gold (consisting of 14 parts of gold and 10 parts of other metals) and 18K gold (consisting of 18 parts of gold and 6 parts of other metals) are used for jewellery. If the ring is too large, you have high risk of loss, while if it’s too small, it’s painful to wear it. This makes the perfect ring size very important. A ring made from the ashes of your loved one is especially valuable, so taking the time to determine the right size is an vital step that will insure years of memorable use. While there are a number of online sources to measure your finger size, there is nothing as accurate as measuring it on your own or at the store, with the help of a professional. To help eliminate guess work, here is a quick and easy way to determine your ring size. 1. Start by cutting a strip of paper or string. 2. Wrap it around the base of your finger, making sure the fit is not too tight nor lose but is just right. 3. Mark the point at which the strings intersect the circle around your finger. 4. 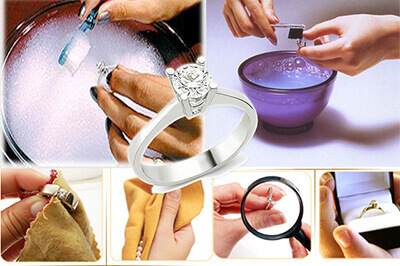 Now, measure the length and convert it to a corresponding ring size on the website. 1. Make sure your ring feels comfortable on your finger. For a good fit, your ring should fit your finger snugly enough to stay secured in place, but loose enough to glide with little effort. 2. Recognize that your finger size changes with respect to time, weather, and your health. For a reasonably consistent fit, measure your finger size a few times over the course of several weeks. 3. Write down the sizes you measure rather than try and remember them. 4. Remember that during night time your fingers swell and so measuring in the morning will likely give a larger size. 1. What if the ring size is too large? Ordering a size too large can be quite frustrating, especially if you have lost weight while waiting for your cremation jewellery ring. Fortunately, there are a few quick workarounds available. First, you can wrap a piece of yarn or ribbon around the base of the ring. This will help fill up any empty space and do the job discretely. Secondly, the problem is common enough that you can use small plastic or rubber bands that are specifically designed to fit onto the bottom side of the ring. This should make it fit better without resizing. 2. What if the ring size is too small? If your memorial diamond ring is a size too small then its best you to ask your local jeweller to resize the ring. Fortunately, resizing rings is relatively less time-consuming than making one. It therefore shouldn’t be a problem to resize your ring to other sizes. 1. Remember some metals scratch easily. It therefore is best to store your jewellery in individual pouches of a jewellery box. Alternatively, you can also wrap your jewellery with cotton wool. This will act as an additional layer of protection against scratches. 2. To keep your jewellery clean, always rinse it in a solution of mild dish detergent and warm water. Make sure you wipe out all traces of water with a soft cloth before storing your ring. 3. Always use toothbrushes with soft bristles (such as the ones present in a child’s toothbrush) to get rid of any stubborn grime or crevices in your jewellery. Using adult toothbrushes will only risk it to scratches. 4. As a precautionary and proactive step, make sure you always remove your jewellery during vigorous and risk-prone activities such as swimming in chlorinated water, working with harmful chemicals, intense physical activity, etc. 5. When in doubt, ask your jeweller for any specific tips to care for your jewellery. They may be able to recommend products specific for diamonds, gold, or other precious materials. Keep in mind that rings made from cremation ashes are genuine diamonds and require no specialized care. When it comes to celebrity engagement rings, Carrie Underwood’s flawless yellow diamond ring is among everyone’s all-time favourites. In fact, the American Idol winner’s engagement ring has been creating quite a stir since we first caught a glimpse of it. Expert hockey player Mike Fisher sealed his love for the country singer with a massive canary yellow diamond, set in a halo design. Designed by Jonathan Arndt, the ring is packed with 12 carats of diamonds. 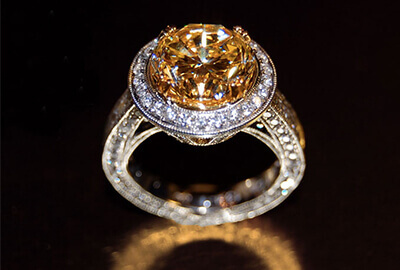 The yellow diamond is truly the central crowning glory of the design, averaging a weight of 5 carats by itself. Encircled by smaller diamonds all around, the ring is rumoured to have cost Fisher over a million dollars and is a sight to behold. Prince Philip chose a simple yet elegant diamond ring for his queen. 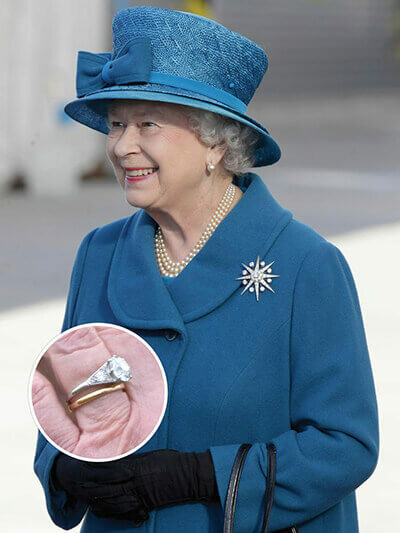 Although this ring might be small in comparison to the queen’s other pieces of jewellery, we believe it is one of her favorite and most treasured pieces (given the fact that she wears it very frequently). The platinum ring is studded with a 3 carat diamond solitaire at the centre along with 5 smaller diamonds on each side. Designed by London jeweller Philip Antrobus Ltd, it is believed that Prince Philip took a lot of interest while designing the ring for his queen. The fact that the diamonds came from a tiara belonging to Philip’s mother, Princess Andrew of Greece, makes the ring even more special. This type of enduring family relationship is the defining characteristic of rings made from cremation ashes. Jackie Kennedy and John F. Kennedy’s fairy-tale romance was the talk of everyone during their times. In fact, it still is. 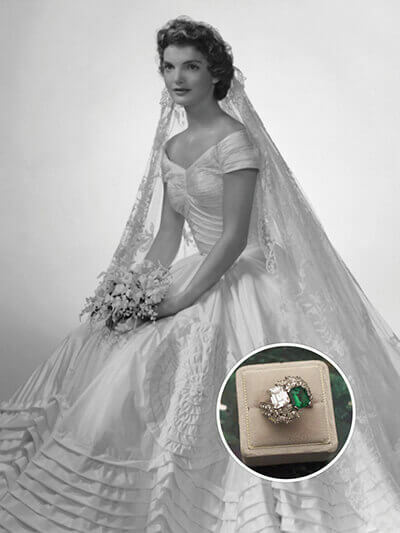 It comes as no surprise then that John F Kennedy chose a ring that was magnificent enough to symbolize his love for Jackie. The 2-carat diamond and 2-carat emerald setting includes a cluster of diamonds that emphasize the two central stones. Fused together within a ring made out of gold, the unique design continues to stand out and attract people to this day. Designed by Van Cleef and Arpels, the design is often regarded as a master piece for its contrasting elements and striking design. 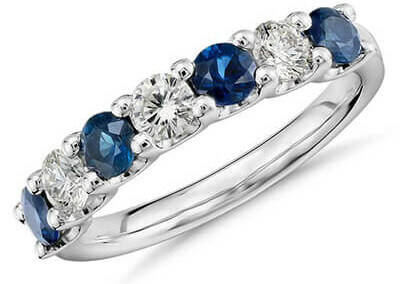 The origin of the blue heart diamond ring dates back to a time between 1909 and 1910. Sometimes referred to as the "Eugénie Blue”, experts believe the diamond mistakenly refers to its connection with French Empress Eugenie. However, the connection between the two is quite questionable as they come from strikingly different time periods. The heart-shaped diamond roughly weighs 35.27 metric carats and is surrounded by a cluster of 25 colourless diamonds. Strikingly blue in color, it is believed that Cartier bought and sold the diamond to an Argentian woman named Mrs. Unzue back in the year 1910. The magnificent blue heart stone was donated to the Smithsonian Institution in Washington DC a few years later and continues to remain there to this day.